We hope you all are having a Fantastic Friday!! 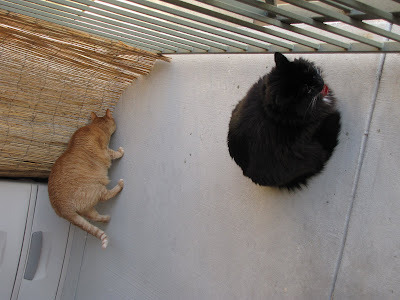 We are having a mini sorta warm spell and we got to play on the porch today!! Mom thinks she has us not able to get out, but she watches us just to be sure!! 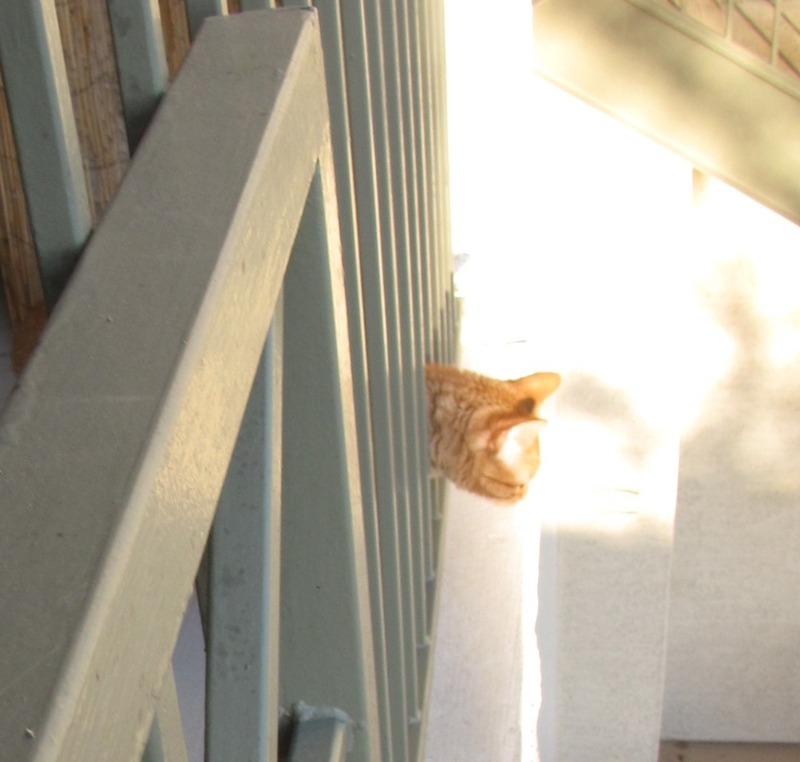 We greeted her from the porch as she came up the steps today!! We LOVE our MOM!! 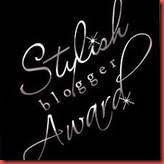 Angel & 6 Garden Cottage Cats for this Lovely Stylish Blogger Award!!! And Since we don't know who has or has not gotten this Award, please feel free to get it from us!! All of our Furiends are very Stylish Bloggers indeed!! Here are 7 things you did not know about us!!! 1. Samantha was born at Mom's house in FL from a Cat who came to her pregnant!!! So Mom has known her all her life! 2. Clementine does not like to be held at all!! But she loves to have her Belly petted!! 3. Samantha is a lap kitty for both Mom & Dad!!! 4. Clementine loves the GirlBean and will play with her and let her pet her belly!! 5. Samantha has known the GirlBean from a new born baby and they are both the same age 7! 6. Clementine has only been with us a little over a year! 7. Mom & Samantha still miss Mr. Tigger very much!! You can see Him at the Blog he started The M-Cats Club!!! porch time IS the bestest, isn't is ! we can see how much you do love your mommy in those pictures. Squee !!! Oh, I think I knew #7 already - I remember when I first found your blog, it was shortly before Mr. Tigger went AWOL and I remember how upsetting that was. I keep thinking that someday he'll show up again... or maybe he sent Clementine so you wouldn't be so sad. YOu do look like guard cats! Thanks for purring for Au. He has liver disease. We're hoping he'll recover. Keep purring please? You're lucky to have a warm spell. It's freezing here. We have a lot of white stuff on the ground around here! We love learning about you! We miss Mr. Tigger too. Concats on your award. We miss Mr.Tigger too and will never forget him. 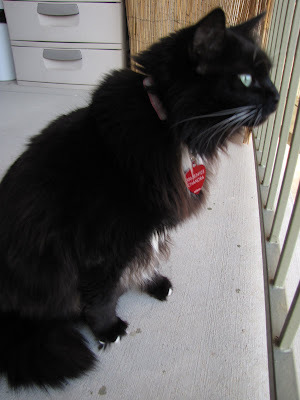 Oh I wanna go on the porch SO bad but I'll jump down so mommy won't let me. Sam just saw you and yelled, "MOMMMM, how come we don't have a porch like that? Build one!" Mom's just shaking her head. We love that you got this great, great award because we know for sure you are very, very stylish! We didn't know you when Mr. Tigger went missing but we are so terribly sorry, it must have been a heartbreak!!! We think maybe Sparkle is right that lovely Clemmie came to you to help you not be sad. Fun stuff about you all. We miss Mr Tigger too. It was a beautiful day! We still miss Mr Tigger, too! It's so good to see you again! We've been offline for a squillion years and we've missed you!